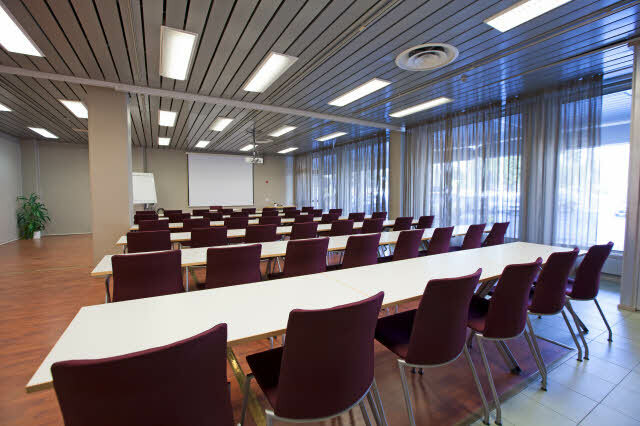 The conference hotel, near the centre of Kajaani and next to the Kaukavesi Watersport Centre, has comfortable rooms, modern meeting facilities and a pleasant restaurant. As you spend the night here, you can relax in various swimming and therapy pools in the modern Kaukavesi Watersport Centre next to the hotel. The high-quality fitness centre IsoHoo next to the hotel is available for our guests at no charge. Our guests are also welcome to participate in the fitness centre's group exercise sessions for a fee. You can relax in our comfortable hotel bar at the end of the day or before dinner at the hotel's restaurant. Our hotel has five convertible meeting rooms and free WiFi available in all spaces. The services in the centre of Kajaani are only a five-minute walk from the hotel. The attractions of Kajaani, as well as many opportunities for skiing, cycling and hiking are just next to our hotel, and even the closest golf course is only 3 kilometres away. The all-round water sports centre of Kaukavesi is adjacent to the hotel and offers several swimming pools, a 50 meter slide, and gentle saunas. Satisfy your appetite in our hotel's bright restaurant with carefully prepared dishes or visit our bar to relax for a while with a drink. It's difficult not to feel welcome. Our meeting facilities are flexible and are well suited for events with 10-150 guests. For larger events, we recommend the adjacent Kaukametsä congress and cultural centre which is accessible from the hotel through a convenient tunnel.